We had been thinking of visiting India for a few years now but we didn’t know where to start. A few months ago, we came across an Emirates advert for reduced-priced tickets for the end of 2016 to various destinations in the world including a number of Indian cities. 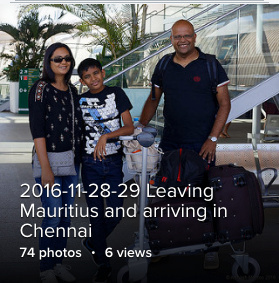 The most affordable ticket from Mauritius was to Chennai and, on a hunch, we bought four tickets for ourselves and our two kids. Interestingly, when we went to the Emirates office to purchase the tickets, the lady there asked us how long we would like to stay in India and it’s only then that we decided for a little more than three weeks, that is from 28 November to 21 December 2016. Three weeks is quite long but we felt that this was the time needed to really discover the places we would visit. And we had had some prior experience of spending three weeks abroad: in the USA in 2011 and, last year, in France (part 1 and part 2). We decided to concentrate on the south of India for this trip, leaving the north for another trip in a few years. We did extensive research using TripAdvisor and Lonely Planet mainly and, after a few days, we realised that, even though we could organise everything ourselves, it would be better to use the service of a local travel agent. Fortunately, one of my cousins knew someone very reliable in Delhi running an agency called Merrygo Travels. We contacted the director and he organised our trip based on our multiple and quite complex set of requirements. 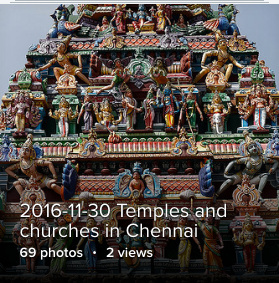 We left Mauritius on 28 November and, after transiting in Dubai, arrived in Chennai on the next day. Naturally, we were all overwhelmed by the typical Indian atmosphere (and scent! ), the more than heavy traffic (and the car horns!) and the air pollution (as we couldn’t see the blue sky with which we are so accustomed in Mauritius). After thirty minutes, we were delighted to arrive in a very good hotel, the Quality Inn Sabari in T Nagar, very close to the shopping areas including Pondy Bazaar. The next morning, after having a copious breakfast, we took an auto-rickshaw to go to the Kapaleeshwarar Temple with its beautiful and intricate sculptures. From there we walked to the Shirdi Sai Baba Temple which, in our opinion, was nothing special. We then took another auto to San Thome Basilica which we found quite interesting, especially the attached museum. In all three places, there were a lot of devout people and we quickly understood that religion holds a very important role in India. After lunch, we walked through a fishermen area to the seafront. We noticed that some of the houses were made of straw and quite decrepit. The next morning, we took a 6am Shatabdi Express to Bangalore which we reached around noon. Dilip, a good friend who previously was our colleague at the University of Mauritius, took us around Bangalore to a guest house he had arranged for us at PES University. After lunch with his family, we did some light shopping as Avinash was in dire need of some T-shirts. It turned out to be much warmer than expected at this period in South India and we hadn’t brought enough short sleeves. We woke up very early and took a Toyota Innova (which seems to be THE standard car for families travelling across India) and, after some hours, reached Mysore. We visited the palace of Tipu Sultan which was quite magnificent, both the gardens and the interior of the palace (where photography was unfortunately not allowed). 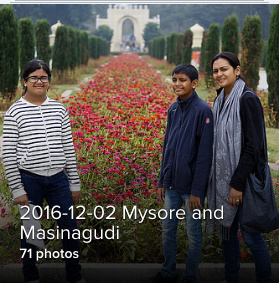 From there, we visited the Mysore Zoo which was also quite interesting with a lot of animals which we had never seen before. After lunch in a mall in Mysore, we drove through Bandipur National Park, a tiger reserve, to reach the Wild Breeze Resort in Masinagudi around 5pm. At 7pm, we left for a night safari in the forest where we were lucky to see wild animals such as elephants, a bear, boars and deer. In the middle of the safari, while rain had started falling, our 4×4 got stuck in a muddy slope. The four people accompanying us took about 30 minutes to finally find a way to dislodge the car from the muck and, as you can imagine, it was a scary but so memorable experience for the four of us. We then drove to the center of the forest, switched off the car and experienced being in pitch dark wild, while rain was still slowly pouring down. We got back to our lodge after one hour and had a substantial briyani there. We slept very well. We did a morning safari in a very cold and misty weather. We had to wake up at 5am and this was tough. One thing we found quite interesting was the inhabitants doing their morning chores: women going to the river to wash clothes, men bringing their cattle to graze, etc. We also saw some animals: deer, peacocks, boars, monkeys, etc. 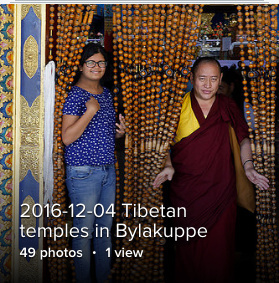 From Mysore, we traveled to Bylakuppe, a Tibetan village about 80km away. When the Tibetans were exiled, a large number settled in India, including, of course, in Dharamsala, where the Central Tibetan Administration resides as well as in Bylakuppe which hosts various monasteries and study centers, the most well-known being the Namdroling Monastery of Nyingma also known as the Golden Temple, which we visited. The atmosphere was quite different from the other parts of India. We felt we had been transported to Tibet (apart from the excruciating heat…) Bylakuppe was, as a matter of fact, a bonus in our trip, carefully arranged by our good friend Dilip. 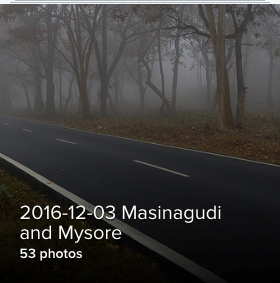 Thanks to him (and his driver, Manju), we discovered places such as Mysore, Masinagudi and Bylakuppe, which we had not initially planned for. We spent our last day in Bangalore exploring the city. We started with the Art of Living in the morning, which was quite beautiful, then went to PES University to meet with some of Dilip’s colleagues. We then drove through the IT center of the city, had lunch, went to school to fetch Dilip’s son and niece and had tea at his place where we learnt that the Chief Minister of Tamil Nadu, Jayalalithaa, had just passed away. 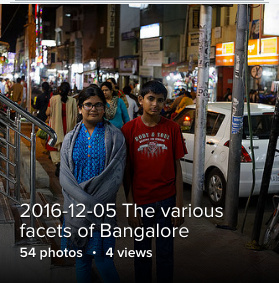 In the afternoon, we walked in the city, visited a few temples, ate typical Bengaluru ice-cream and bought some books. 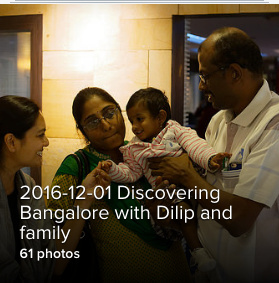 We then returned to Dilip’s place to have dinner and we left after thanking him, his wife and his mum for everything they had done for us. On the next day, we left for Kochi for the 2nd part of our journey in the South of India.